Large boulders along the rocky shoreline of Green Point in Gros Morne National Park in Newfoundland, Canada create the perfect wine glass holder. Watching a sunset at Green Point in Gros Morne National Park in Newfoundland, Canada is the ideal place to spend a romantic evening sipping wine. The large rocks on the shores of Green Point make the perfect holder for the wine glasses as the sunlight sparkles through the red and white wine in each glass. 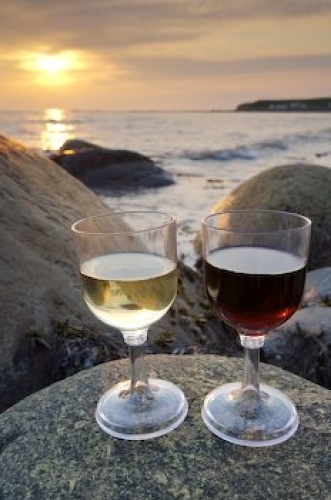 Picture of the ideal wine glass holder on the shores of Green Point in Newfoundland, Canada.